Product code: VM981 Categories: Home Living, Kitchen Aids. 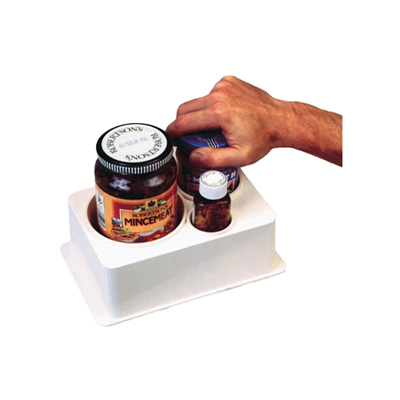 A tool designed to assist those with limited grip or the use of only one hand to open jars and bottles whilst at the same time preventing spillage. Three inverted rubber cones hold any container, from the smallest pill bottle to the largest jar upright, firm and steady. It will take a variety of shapes and sizes including child proof containers, from 2.5-cm to 10-cm. Rubber feet stop the spill-not moving on smooth surfaces or it can also be fixed permanently onto a worktop or contained in a drawer ready for use.